Seattle was a bit of a whirlwind, so I didn’t have much downtime in the hotel/airport to wrap up this series until now. 26.) The Paris Metro is the only subway I’ve been on with a reliable ventilation system. Say what you want about deodorant usage, this was the only place that acknowledged we were cramming people into an underground metal tube and breathing might be required. 27.) The Louvre is the only museum I’ve ever been in that did NOT have ventilation. I’d read Everywhereist’s post about the Louvre and what a frat party it was, but I was skeptical and wholly unprepared for the realities of thousands of people in a Renaissance Era building. Frat party, pfft. I would have thanked the lord if someone offered me a cold Natty Ice while we were in there. 28.) Since I’ve been using the gamer tag “Viktory” for about 7 years now, I was more than a little disappointed that the Athena Nike was not on display the day we were there. So much for the epic “my head on a winged god” selfie I’d imagined. 29.) Seeing the Rijksmuseum was cool, but maybe I’ve been spoiled by great museums like The Met and The V & A. Going to see what is mostly a national collection left me sorta deflated. Kudos, though, for the ballsy “Art is Therapy” currently on display. These signs absolutely multiplied my enjoyment of the place, and resonated with the conversations we’d had at Noma earlier that week. 30.) Underestimating distances in Copenhagen: adds a few minutes to your exploratory walk. Underestimating distances in Seattle: potentially fatal. Glanced at a map and thought the pub crawl for MozCon was “just around the corner”, ended up trudging up a hill for and crossing in front of traffic that couldn’t really see us as they drove into the setting sun. Next time, in Siri we trust. 31.) Copenhagen, Amsterdam, Paris, Brussels, Seattle: great weather to walk in, and have a rail connections practically inside the airport. Phoenix: Pretty much walking on the surface of the sun, and rail use requires that you wait outside twice before you even get on the train. Great planning, hometown! 32.) In Brussels it honestly never stopped raining. Sometimes it slowed to a mist and made walking around completely do-able, but it never fully stopped. It actually rained on us at some point in every city we went to, but only Brussels had the chutzpah to keep it up. Sure made those jackets we bought at REI a key investment. 33.) Airport security is totally suspicious of bike locks. Had to get it checked off by no less than three people each in Brussels and Heathrow. I’ve tried to think up a joke about this, but it’s escaping me right now. 34.) Yes, it’s 2014 and some folks still have no idea how to travel. (OH: “Nobody ever told me you have to take the liquids out of your bag”.) It’s up to you to decide whether this makes you laugh or lament. Dateline Brussels – Didn’t get to post an update from Amsterdam or Paris due to wi-fi issues, but it’s 1am and our flat is located just above a club that does all night on Wednesdays it seems. 17.) Not having AC is totally manageable when the over-night temps drop into the 50s. 18.) …except when mosquito net curtains are not 100% effective. I’m looking at you, Amsterdam. Probably the last city where I wanted a blood-sucking parasite to make it’s way into my room. 19.) Having a list of “must-sees” is helpful when adventuring in a new city, but be sure to give yourself time to really explore a place and live in it. When I travel, I like to know one thing that I want to do in a given area, and then be open to whatever else I might find nearby. In Copenhagen, I had friends nearly paralyzed when trying to figure out which place on their lengthy lists we should go to for after-dinner drinks. Meanwhile, there were plenty of local bars nearby where we could have certainly had a memorable time. Moral of the story, pick fewer things you need to do, and allow more time for the universe to surprise you. 20.) In Paris, hit Rue Montorgueil; you’ll find anything you could want on that street. We went here because a friend recommended Stohrer, but I wish we’d gotten that recommendation 12 hours earlier. We could have picked up all the supplies for our picnic that day on one block. Instead, we ended up wandering around the blocks near the Champ du Mars and sorta made-do. 21.) Speaking of wandering, sometimes you’ll go into a shop and the workers/owners will have no desire to help you, and the very next time you’ll find someone who not only helps you pick out a product, but gives you recommendations on picnic sites and places to avoid the rain/grifters. 22.) I’m pretty sure someone needs to redraw Maslow’s hierarchy of needs to include wifi now. I managed to not use my international data until we got to Brussels, but there was plenty of screen-shotting maps and missed messages/connections along the way. Plus how am I supposed to correctly tag my instagram shots if I don’t get wifi until I’m in the next city? Dang! 23.) World Cup in Europe – This is the way I imagine sports should be experienced. In Holland for the Quarter-Finals, folks were decked out on the streets, party boats going all day, and the plaza outside the hotel was packed for the full duration of the match, and then the place went nuts! In Brussels just now, after Argentina won, a random group of Argentinians just passed by, parading through the streets with drums, two hours after the game was over. 24.) By the way, Copenhagen must be the easiest place to see celebrities. Normally I don’t go in for “who was spotted where” sort of thing, but walking pass Andre 3000 and Julianne Moore within 12 hours was a pretty cool day. 25.) Sometimes you come this close to eating at the world’s best restaurant. But even though I didn’t get on the booking, my friends treated me to a once-in-a-lifetime tour of the kitchens and test areas. Amazing stuff, such great work ethic and so much commitment to serving the customer and the food, without any place for ego. When you’re in the kitchen of Noma and the first thing Rene does is recommend breakfast places to you, you know it’s like nothing you’ve ever experienced. I’ll wrap up this one on a high note. I’m down to two more days on this trip, then I get to spend one day at home before I’m off to Seattle for Mozcon. Checking in from Copenhagen. Had a great few days exploring this town, with a couple more to go before we move on to Amsterdam. As before, some bullet points on things I’ve observed on the trip. Enjoy! 9.) Pop into a hotel and ask the staff for their favorite places to eat. Resulted in a crazy delicious meal at a pub in Malmo, Sweden. 10.) Herring, not as weird as I thought, still solidly fishy and pickle-y; two of my least favorite adjectives. 11.) When the heat is not suffocating, you can easily walk for days and never notice. In the last 36 hours I’ve logged over 20 miles walked. My calves and feet are aching now, but I’m using the distance as an excuse to go for the gastronomic gusto and enjoy some great vacation meals. 12.) Euro temperatures and weather lack consistency. Yesterday it was supposed to be cold & wet, so I brought my jacket and got more sweat than rain on it. Today was forecast as warm and dry, and I got rained on within minutes of leaving the flat. Actually, we found the rain again shortly after we got off the train in Malmo, which may have been the same storm cloud we left behind in Copenhagen an hour earlier. Even within the same area, we’ve been walking down the block, I’ve put my jacket on, turned one corner and been sweltering, without the thermometer budging. 13.) Train stations are legit! All the atmospheric travel fun of an airport without security and waiting around. Today we caught multiple trains with less than a minute to spare. Imagine doing that with a flight anywhere but Vegas. 14.) I’ve had a blue-striped long-sleeve shirt from American Eagle for a few years that I’ve loved. Turns out, this same pattern is well loved among women’s wear designers in Denmark. I’ve seen no fewer than 4 ladies wearing the same scheme. Great, there goes that shirt. 15.) Canal tours are a great way to get perspective on a city, and enjoy an hour away from exhaust fumes or sidewalk crowds. I love exploring new places, but even after three days criss-crossing this town, there were still tons of things I didn’t see until our 1-hour tour. 16.) Holy atmospheric science! Transitioning from canals to the open harbor, the weather instantly changed. Waves, sea breeze, mist, and nearly a 10 degree windchill. Pro: provided one of those romantic “let’s huddle up under my jacket” moments. Con: It was hella cold! Got another day in Copenhagen, then on to Amsterdam, Paris & Brussels. Catch ya next time. A collection of things I’ve found cool enough to share. 2.) Streaming ESPN radio: about time American media made it easy for us to consume online while at work. Surprised FIFA didn’t try to sell an MLB.TV type package here. 4.) Google Street Art – Best use of Street View ever. 5.) Chromecast: Being a cord-cutter has never been so easy and enjoyable. Using my phone, iPad or laptop beats using another device remove like the Roku required. Plus, YouTube on TV! 6.) TellTale Games The Walking Dead on iPad. Best “I’ll just play until I fall asleep” game this year. Also, zombie before bed = win. 7.) Getting the Plastic out of the Ocean: http://www.theoceancleanup.com/ <— You can help on this one. Check it out. Aside from a little bit of snippy-ness regarding the original check-in, I think we’ve been in a pretty good mindset as we began our vacation this weekend. That said, I’ve still got a strong snarky streak that probably ought to express itself somehow. So, I bring you my travel insights from the road. 1.) Putting your seat in the any position other than strictly upright should be punishable by immediate ejection from the aircraft. We are all uncomfortable and nobody wants your head in their lap. If you need to recline on this flight, they’ll happy sell you a lay-flat seat towards the front of the plane. 2.) If you do decide to push the limit and recline your seat, I have full rights to use the back of your head-rest as I see fit, being as you’ve invaded my allotted space. Typically I will go ahead and put my pillow against it and attempt to sleep in a quasi-leaning face-down position. If you’ve been particularly odious, such as the woman today who refused to put her seat back into position during meals, I may go ahead and see how many items I can balance atop the head rest, or use it to hang my backpack off of whilst I retrieve every item I packed in there. 3.) When your initial flight has been cancelled, the last thing you want to hear from customer service is “oh, that’d be a no-show on your connecting flight”. Well, guy, I’d be more than happy to make that flight. What can you offer me by way of teleporter or time machine? Got a spare Wonka-vator back there? 4.) If I need to go through security again between flights, the least you could do is slide me one of those super official passport stamps. Otherwise, what did I just get felt-up for? 5.) Folks that think it’s acceptable to say racist stuff at the airport clam right up when you stare them directly in the eye. Or what would be their eyes if they weren’t averting their gaze. Truthfully, I’ve only got a small sample set for this one, for which I am thankful. 6.) Getting a sandwich from Pret makes the trip feel real. Especially since I can’t find a Cinnabon in the airport anymore. 7.) Lucky #7! Plan a lengthy European trip and your career will take off! True story, last time I came to Europe for two weeks was July 2011, and the day before I left I was able to secure a new position that started my career in Online Marketing and pretty much saved my work life. This time around, on the eve of my departure I was officially promoted to Program Manager over our growing Online Marketing & Strategy team. It’s been a wonderful three years filled with lots of growth and plenty of difficult times, but I’m proud of the work we are doing and glad for the opportunities we get. Context: Our original outbound flight was canceled/delayed due to mechanical failure Friday night. We ended up leaving Phoenix for Copenhagen (via London) at 4pm on Saturday. Not a big deal except that it meant we would not be able to spend Sunday/Monday in Aero as we’d previously booked as we won’t arrive in Copenhagen until ~8 hours after we were supposed to leave for the island. I’m sure it will all work out in the end, though I wouldn’t mind if they’d been forced to have us stay a night in London. After all, it is on my short list of places to live after graduation. I’m about to catch a flight to Copenhagen in a few hours, for a tremendously exciting trip around Europe. The lady and I will be joining a few of our friends Denmark, then going our own way and checking out a few other countries while we’re over there. Of course, as with any tourist, I am certain I’ll be capturing tons of pictures throughout our trip; primarily for sharing on social media or use in future posts. With this in mind, I reached out to professional photographer Marc Montez with a few questions about the type of camera I should take and what my expectations can be for usable images compared to convenience. What followed was an amazing windfall of knowledge and insight from Marc. It’s taken me a while to get this post ready to go live, but I’m excited to try out some things on this trip, and hopefully this can be a helpful resource for other in the future. This post is pretty long, and a little light on images, so I recommend checking out Marc’s #sgnlunchtimeseries on either Instagram or his website. The image quality speaks for itself and lends a new angle to what we talk about below. What are the key differences between Point-­and-­Shoot cameras and DSLRs? There’s quite a few differences between the two cameras although as time goes forward P&S and DSLR are starting to assimilate certain features of the other to meet consumer demands. The main differences to the average person are the ability to change lenses, manual controls and lighting options. P&S have a single lens and even though that lens may be a zoom lens it is limited in both focal length and aperture. For anyone reading who hasn’t studied photography at all, aperture refers to the amount of light allowed to pass through the lens. Think about the pupil of an eye. It can dilate and constrict adjusting to different lighting situations. The reason you would want to control this, aside from exposure, is that by changing the aperture of a lens you are directly controlling how much of the photograph is in or out of focus. Most landscape photographs have a very deep depth of field where everything from the foreground to the background in the image is in focus. Conversely, portraits and other types of photographs generally have a more shallow depth of field where only the subject is in focus and the rest of the photograph is blurred out. This is controlled by the aperture of the lens. With the DSLRs you can manually control this ability. The lenses on P&S cameras are generally set to have the entire scene be in focus. The advantage of this is that you don’t necessarily need to concentrate on focusing perfectly. This means that the photographs you take with a P&S will rarely be out of focus but it also means that they won’t look very artistic. Lenses for DSLRs range in quality but the ability to use extremely high quality lenses gives you the ability to produce razor sharp images with very pleasant blur. Changing the aperture of a lens is one of the controls that the camera does automatically on a P&S that you can choose to take over when using a DSLR. This is one area where the two different camera types are starting to merge together. Consumers want the quality that an SLR can produce but not the headache of trying to figure out exposure and the like so now most SLRs have a lot of automatic functionality and even scene modes. Likewise some consumers want to have the ability to control those aspects of the camera but don’t want to invest so much money in an SLR system so a lot of P&S have some manual controls as well though they’re usually difficult to access. When it comes to manual controls what we’re really talking about is the ability to take over controls of the camera for creative purposes. The last major difference I’ll bring up is lighting. P&S cameras are extremely limited in this regard. The only strobe they have is usually a small built in flash that hardly ever produces a good result. There are a lot of reasons for why this is but they’re not important for this discussion. Just know that to use flash in creative ways it must be taken off of the camera and that’s the advantage a DSLR has. Aside from flash lighting, DSLRs are generally much better at producing better images in a far greater range of lighting situations. They’re better at low­light since they have larger sensors and can manage noise better. They’re also generally better at being focused in challenging lighting, plus if the camera struggles with auto­focus you can manually focus. Another small difference with a big impact is the ability to shoot RAW files instead of only JPEGs. If you’re serious about editing photos RAW affords you the most digital information to work with and is a big deal for professional photographers. A DSLR is a superior camera in basically every way but it comes at a cost of a steeper learning curve, increased weight/size and of course a significant amount of money. Of course having a very capable tool is only as good as the person wielding that tool and I wouldn’t recommend investing in an SLR system without also investing in learning at least the basics of photography. Doing one without the other is essentially setting yourself up to use a very expensive much bigger point and shoot. Does an interchangeable lens camera, such as Fuji X­M1 or Sony Alpha NEX series offer an intermediary step between Point-and-Shoots and DSLRs? These cameras have been around for a while. It seems as though they are indeed trying to fill a market gap between the two big categories of camera. The advantage these cameras have over P&S are similar to those a DSLR has. They have larger sensors typically, manual controls, the addition of a hot­shoe for external flashes and of course the ability to change lenses. They still fall a little short however when compared to DSLRs. While these cameras typically can change lenses a lot of the systems use lenses specifically designed for that camera. That means that if you buy something like the Nikon­1 you get the ability to change lenses but it’s from a set of 3 different lenses designed for the camera. You don’t get access to the entire repetoir of Nikon lenses like you would with a DSLR. The advantages that these cameras have over DSLRs are similar to the advantages P&S have. They’re typically smaller, they’re more automatic and they’re less expensive. While they do fall into an in­between category I wouldn’t recommend using them as a stepping stone to an SLR. The reason being that SLRs have gone down in price so much that for not very much more money you could buy into an SLR system. Even the lowest end SLR camera will get you into a system where you have access to the entire lens line­up and flash line­up. You could get a $400 SLR and invest your money in high quality lenses and then when you’re ready you can upgrade to a better SLR with more features and take all your lenses with you. As a photographer I can honestly say there have been trips where I was going somewhere and wanted to take photos but didn’t want to carry around my heavy camera everywhere I went. In those situations it seems like there’s no winning. Either I don’t take the camera and wish I had, or I take it and resent having it because my neck hurts and I constantly have to keep an eye on it and make sure it’s ok. These camera may offer a solution to that problem. Is there an image quality difference between the different kinds of digital cameras, or does the equipment only impact zoom­level and composition capabilities? There is absolutely a quality difference. Quality in digital images goes like this: the bigger the pixels and the more of them the better quality the image. One myth I would like to dispel is that more megapixels means better quality. While more megapixels means more digital information, if each pixel is microscopic then you actually sacrifice color quality, sharpness and run into a whole other list of problems like digital noise. You want as many megapixels as you can get but you also want each individual pixel to be as large as you can get. A full frame sensor (that means the sensor is the same size as a 35mm film negative would be) that has 16MP will always have the ability to take a better quality image than a APS­C sized sensor (that means the sensor is the same size as APS film, smaller than 35mm) that has 20MP. Sure the APS sensor has 4 million more pixels making up the image, but those pixels are crammed into a smaller area than the full frame sensor. The only way to do that is to make each individual pixel smaller. P&S cameras have much, much smaller sensors than SLRs. Besides the size of the sensor there’s lens quality. Remember the lens that’s built into your P&S is all you get. DSLRs open up a vast library of lenses. Some of them are junk and not even comparable to the P&S but others are as good as it gets as far as glass quality and functionality and even the cheapest DSLR is able to use them. As far as zoom and composition those things aren’t really dependent on the camera. You should always practice good composition no matter what kind of camera you’re using. Many P&S cameras actually have a wider range of zoom in their single lens than you can find in an interchangeable. My mom has a P&S that goes from 28­-600mm. They don’t even make a lens like that for an SLR. However there’s the issue of quality. Something you might consider about quality is this. What are you planning to do with the images? If you want snapshots, and you don’t plan on editing the images really and their final output destination is social media then you’re looking at image sizes that are so small digitally speaking that a 20MP file is truly overkill. If however you want to make poster-sized prints, do any kind of editing beyond brightness/contrast or display them anywhere besides a monitor then you want as much high quality digital information as you can get. How about the camera that everyone has with them already; their smart phone? If the main intent is to publish the images online (either a blog or sharing via social media), is there a noticeable difference? Interesting question. I’ve actually spent quite a lot of time on this topic and I even have a series dedicated to trying to make good images with nothing but a cell phone camera. The answer to your question is yes there is a noticeable difference. However that doesn’t necessarily mean that a cell phone camera or a P&S for that matter can’t take a good picture. It just means that you’re limited by the capabilities of the camera. This isn’t typically too big of an issue if you learn some basic photography. When I say basic photography I mean fundamentals like composition, visual elements and a basic understanding of lighting. If you’re armed with the fundamentals then you can make a good image regardless of the camera. That being said I would never pretend that any image I made with a cell phone camera couldn’t be taken at a much higher quality with a higher end camera. It goes back to the difference in quality. Cell camera sensors are tiny. Look at the lens on your camera’s phone. See how tiny that thing is? The sensor is even smaller. If you happen to have any 35mm negatives lying around pull one out and look at how big the negative for an image is. That’s the size difference we’re talking about here between a cell phone camera and a full frame DSLR camera. It doesn’t matter that the phone camera has 18MP because those 18 million dots are crammed into an area so tiny you couldn’t even see them with the naked eye. In fact, it’s kind of amazing the quality that can be produced by a cell phone camera when you think about how tiny the camera actually is. If the output is the internet we’re probably talking images that are around 1000 pixels tall to be able to fit on the screen without having to scroll. At that size a cell phone image will probably look just fine. The larger the sensor the better quality the image though, and you can tell even that small. Higher end cameras have more dynamic range and much higher quality digital information to work with. Another thing about cell phone cameras and most P&S is that they are processed in the camera to come out brighter and more contrasty. The camera software automatically bumps up the brightness, bumps up the contrast and over saturates the colors. That doesn’t sound bad, and it isn’t if you’re happy with the result, but you can’t ever UNdo that. Shooting in RAW means the image comes out exactly as the sensor recorded it, every single pixel of information is there. You can use a food analogy here and think of a RAW file as something that needs to be cooked. So if we go along with this analogy cell cameras shooting in highly processed JPEGs are kind of like microwave dinners. They’re easy, quick and often times taste just fine. An SLR shooting a RAW file however is more like a delicate cut of Kobe beef. It takes effort, knowledge and a little bit of talent to cook the thing but when it’s done it sure blows that microwave crap out of the water. That doesn’t mean every image gets cooked well every time but the potential is alway there. It’s all about application. Is this a personal social media profile or is this a professional business website? The image sizes are probably pretty similar but the quality of the images probably matter as well. What are the main things someone needs to consider when selecting the “right” camera to travel with? I love this question since I plan on traveling in the near future and of course want to take amazing photographs. It’s also a difficult question because there’s a lot to consider. Let’s just assume you’re always going to have at least one camera, that being your cell phone. Knowing that your cell phone is pretty limited in its capability though you want to take a “nicer” camera with you as well. In that case, the major things to consider are size/portability and flexibility. Just exactly how important each of those things are depends on where you’re traveling and what you’re doing. There are various ideal pack­outs for various trips but when I travel I’m all about mobility. If the trip was a video game we’re talking scout/archer/recon/stealth class here. I want to be able to move in and out quickly and quietly but still be able to hold my own in a fight. I don’t want to clank around in heavy armor and slow everyone down but I also don’t want to be so light that I have no protection and no serious weapon. That means I only take the equipment that is necessary to get the images I want but it’s still good equipment. That’s an important thing too; there should be some planning involved in choosing what the ‘right’ camera is. You should take a second and look at your itinerary and at least think about the kinds of shots if not specific shots you want and try to pack for that. My advice is to set up like a stealth fighter. If you’re taking your SLR then take the camera, take one lens, and take one flash. If the lens is a wide to tele zoom lens then you can cover a huge variety of images. Having such a small set up is lighter and smaller and that’s important to me when I’m walking around from place to place all day. I want a set up that I can put in a messenger bag with whatever else I’m carrying. An SLR with a lens attached and a strobe might even be too big for a lot of people. No one would argue with you if you opted to leave your beast of a camera at home and instead take a P&S based on size alone. Every time I’ve done this though I’ve regretted it. I found myself in situations thinking ‘man I wish I had my REAL camera’. I always take an SLR with me, I’ve just been burned too many times by the limitations of a P&S when I’m in amazing places. I just accept that my shoulder is going to be sore from carrying the heavier camera but that it’s worth it to get the images I’m after. It’s been a few months since I’ve publicly checked in on the goals and strategic initiatives I set for myself back at the start of the year, so let’s dive into those. Starting off strong, I’m glad to report that this one was either a resounding success, or an example of rampantly underestimating one’s self. As displayed in the super polished charts below, this particular goal was met well ahead of schedule. Much like Newton always told us, an object in motion tends to stay in motion, and once I hit the stride of biking to school/work multiple times a week, this goal was easily accomplished. 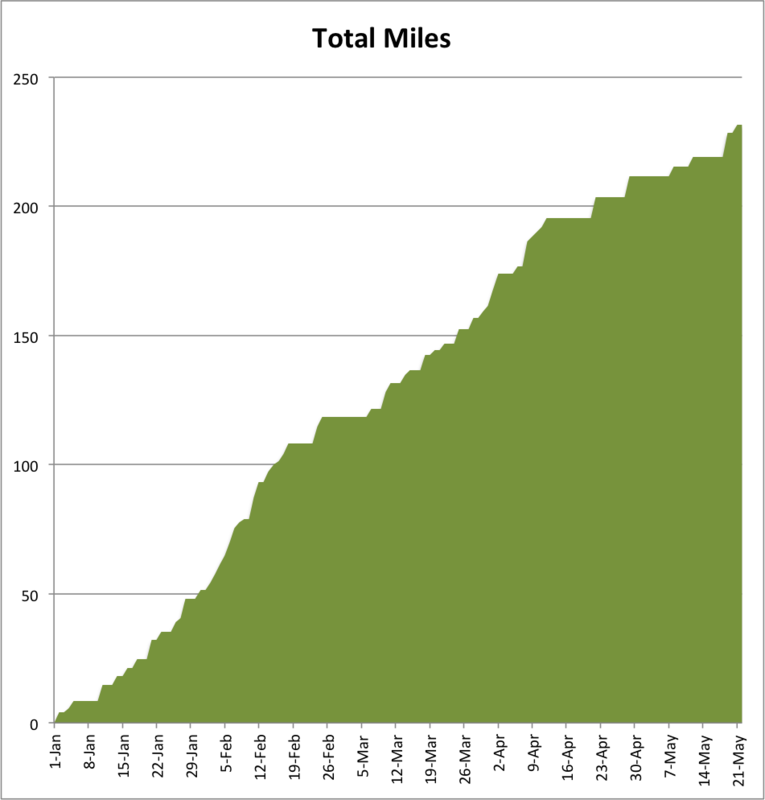 As I approached the original mandate of 100 miles, I thought I might aim for 250 total miles. Unfortunately, as the chart below shows, there were a few times in March & April when I didn’t keep it going for one reason or another (Spring Break, high ankle sprain from a 5k, hectic work/school schedule, etc). Ultimately, I’ve been more active in the last 5 months than I was in all of 2013, and I’m determined to not reverse this trend. Another solid checkmark on this one. By the grace of the almighty curve, I managed to pull slightly higher marks that anticipated, and finished with a 3.42 GPA for Spring, and a cumulative 3.33 for the year. Take THAT rude academic advisor lady who tried to tell me ASU might be too hard. Today’s update will be the 34th post to go live between my two projects that are in production. I’ve also written a few articles yet to be published for that food blog I keep talking about, so I’m confident this goal will be well exceeded. Of course, I owe an amount of thanks to my MicroEconomics class for being both slow-paced and gracious about my laptop use in class. Many of my updates this Spring were drafted while I was in that class. Actually, this goal has me particularly frustrated, but mostly because I’m frustrated at myself for not putting as much specific attention towards this one. I may actually be worse off than when I started this process, despite a more active lifestyle and better nutrition. If anything, though, I should use the progress I’ve made on the other three items to fuel this last one and finish the year with a complete victory. Not taking summer session this year means I have 106 days between my last Final Exam of Spring and my first day of class in Autumn (or what we call “autumn” around here, which is really just an obnoxious extension of summer). While it’s important to relax and recuperate from an exhausting school year, I figure that dropping all learning and the habits that enforced that learning will only spell trouble for me in the fall. Sort of like a professional athlete that doesn’t work out all winter and reports to Spring Training with 30 extra lbs. No Bueno. Ha ha, who am I kidding? I’m already a terrific dancer under the right circumstances. I could also turn this into something that’s productive but not strictly academic. Same as above, but read all the random books I’ve bought because I thought they’d look cool on my bookshelves at home. Alright, that seems like a robust-ish list. But are they all realistic? What are the constraints I might be facing? 1.) Should take ~ 1 hour a day. Absolutely less than 2 hours daily or I’m certain I’ll fall off after the first week. 3.) Should have some tangible/measurable outcome at the end. I should have either produced or completed something entirely. Spending 100 days learning Mandarin to be “only sorta maybe able to speak it” would not be the wisest use of time. Time is already ticking away, but I think I’m going to enjoy the read of this lazy Sunday and then make a decision tomorrow morning. If you have any suggestions on things to add to the list, please let me know. What are some of your goals/projects for the summer? The other day I was looking for a particular South Park meme to respond to a co-worker’s message (as one does), and encountered an interesting result page from Google. 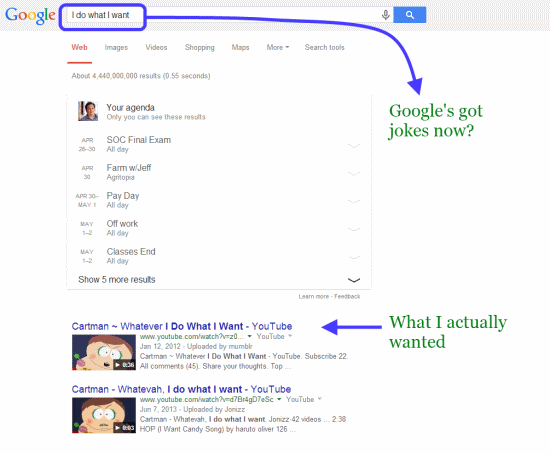 Clearly I want to find the Cartman link, but was surprised to see Google importing my own calendar entries for this search term. So I tested a few different variations before I finally noticed the “learn more” link. Turns out this was just a feature that I’d overlooked when the flight and contact info rolled out. Funny thing is, when I try to search for “what are my plans for tomorrow”, I don’t get anything that looks like my original image, or anything special at all. So I tried a few more variations to see how smart it was. This observation may not be terribly insightful, but it is interesting to see the implementation, and limitations, or machine learning and data cross-over. Note: This may have been a test or potential bug, as the same search term today does not bring back my calendar entries. Shortly after I started following Brian Fanzo earlier this month, he tapped into a vein that I’d been considering for a while, namely the division of audience among one’s twitter followers. Or, to put it more plainly, do the different groups of folks who follow me get really annoyed when I tweet about different topics? My position on this topic has gone back and forth a couple times over the years, but then again, so has my level of Twitter activity. (One of these days I’ll tell the story of how Twitter got me the job I have today.) As it stands right now, I have two personal Twitter accounts, one for general use and one specifically for gaming topics, as well as admin over a third account for the gaming podcast I co-host. In some regards, this may seem like I’ve already over-compartmentalized things, especially given my statements last week about how higgledy piggledy my blog topics are and will continue to be. Then again, I know that on my personal account I have followers who come from different audiences and are probably following me for different reasons. Right off the top of my head, one could easily group Phoenicians and others who are interested in local topics in one bucket and online marketing (SEO, Social, Inbound, etc) in a second bucket. When I’m tweeting about one of these topics multiple times a day (such as when I’m at a conference), I’m very certain that I’m turning off anyone who’s not in that bucket. Is it better to retain this kind of diversity on one account, and allow my self-expression to be more authentic, or should I do something like what Brian displayed above and create further accounts that are more genre specific, to avoid spamming the feeds of those who may only be following me for a certain set of topics? Is curating your tweets self-censorship, or simply part of good modern etiquette? Since putting my head in the sand is rarely a position that I can take and still rest easy, I’m going to lean towards Option 3, and act accordingly. First thing I thought, “what are my ‘last few hundred’ tweets about, and would I follow someone like me?”. To that end, I did a quick analysis of recent tweets, though I stopped at the last 50, because the data after that was skewed by a streak of tweets I sent out whilst ranting on the #DSP14 conference. I decided to sort my tweets based on the topic or expression conveyed. Below is a quick pie chart of breakdown. I may have played it a little “fast and loose” with the Bragging and Ranting tags, but I didn’t want to mince levels of severity. I also didn’t separate @mentions or replies, but rather applied the same sorting system to those ones. In all, @mentions accounted for 34% of my tweets in the last three weeks; not a horrible engagement rate I think. Know what is horrible? The fact that I am three times more likely to complain about something than to directly help someone else. If I combine retweets with helpful tweets (which were mostly @mentions), the numbers are a little closer, but still not really racking up the karmic balance. 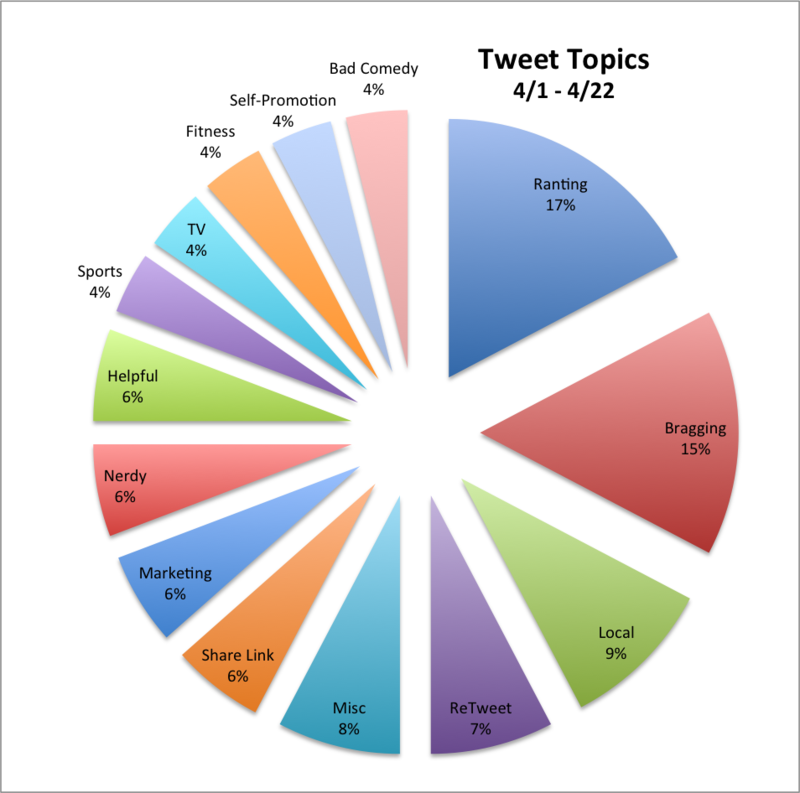 Getting back to the meat of the issue, though, this small sample size seems to illustrate that my tweets are distributed across an array of topics (marketing, sports, nerdy stuff, local topics, tv, my attempts at fitness, etc). In my mind, this represents the natural thought patterns that many of us have, and I’ve just been more apt to tweet about something than to sequester it into a different medium. Perhaps this conundrum is unique to me because I don’t use Facebook, and really only use Google+ for a narrower set of topics. If this means that when the day comes that Rand’s reviewing my tweets and deciding whether or not to follow me, he will be greeted with a massive hodge-podge of daily thoughts, at least I’ll present something more well-rounded and hopefully a more fun experience overall. I’d love to hear your thoughts or personal experiences on the this topic. Either leave a comment below or reach me via Twitter or email.